Sadly and suddenly on December 30, 2012 Bernice Margaret Baskin passed away peacefully with her daughter Virginia by her side at Carman Memorial Hospital. Funeral services were held January 5, 2013 at Doyle's Funeral Home. Bernice was predeceased by her Mother Margaret Ida (Stacey) Baskin Aug 30 1947, Father Bertal James Baskin, May 4,1966 and Sister Dianne (Baskin) Martin July 24,1991. Mom was born November 29, 1931 in St. Chrysostome, Quebec. She was the oldest of 10 children. Mom took on the responsibility of Mother after the death of her mother who was only 35 yrs. old. Mom was 15 and the youngest was 18 months old. Mom worked as a nurse at the Royal Victoria Hospital in Montreal, Quebec in 1956 for several years. She went on to work at the Bussey Nursing home in Lachine Quebec then worked for 9 years in Caughnawaga Quebec at the Kateri Memorial hospital. Mom came out west to Alberta in 1979 worked several years out there, then moved to Manitoba in 1986 to be closer to her grandchildren and me. She started working homecare in Carman in 1987 and retired in 1996. Family and tradition meant so much to my mother. She spent years working on the family tree. As for back as I can remember Mom worked on it, even up until she went into the hospital, she was still working on it, adding new information she had rec'd. It is amazing the information and work my mother did on the family tree. We always enjoyed listening to the stories she would tell of growing up. Even though she had a hard life she never complained about it. She always talked fondly of the memories she had. Mom had an amazing heart, and was always there for her family and friends. She was always willing to give a helping hand, and never asked for anything in return. She was a wonderful loving Grandmother, Aunt, Great Aunt, Mother and friend. Keeping the bonds of family together were very important to Mom, and she always kept in contact with all her nieces and nephews, and her brothers and sisters. There was never a birthday that went by that they didn't get a birthday card from my Mom. 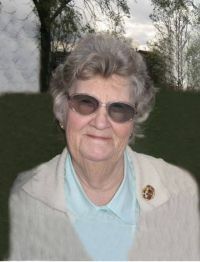 Mom leaves to mourn her passing her daughter Virginia Pither, Grand children, Amanda Pither and Phil Clay who reside in England, Andrea Pither and Matthew Pither. She also leaves to mourn her: Sisters Elizabeth (The late Reid) Kerr, Patsy (the late Alvin) Chisholm, Dawn (the late Wayne) Boborosky, Anna & Les Doering, Brothers, Irvin (Christina) Baskin, Walter (Shirley) Baskin, George (Sadie) Baskin, Alvin (Betty) Baskin. Many nieces, nephews and several very close friends. Mom was an amazing strong woman. Who will be greatly missed but never forgotten. May you now rest in peace Mom. You will be remembered and loved Forever and Always. Donations can be made to St. Boniface hospital, Cardiology Dept.